In terms of Instagram stakes, Paris is riding high in the hall of fame. Whether it's an imposing Haussmannian apartment block, a surprise flea market or a picture-perfect croissant and coffee moment, the French capital is crying out to be photographed. But we've done the hard work and scouted out the most Instagrammable walks in Paris – so you can rake in the likes, while on a hike. Our only tip? Some of the best things about the city can't be captured in one pic, so leave your phone in your pocket from time to time. Who's it for? The romantics – this stretch of the city is as Parisian as it gets. Where do I start? Get off at Tuileries (line 1) and grab a death-by-chocolate hot chocolate to go from Angelina. 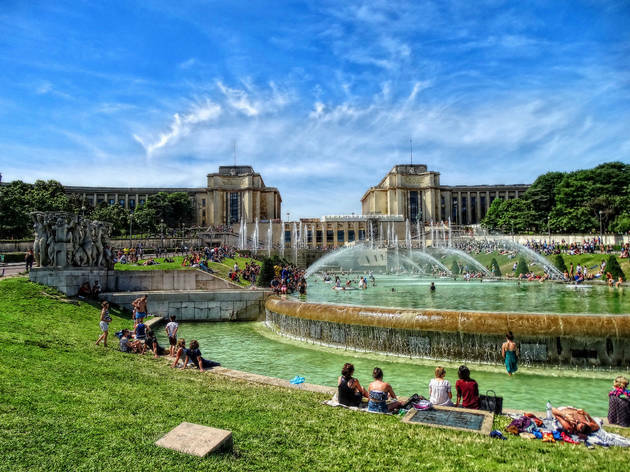 Then wind around the Jardin de Tuileries, keeping an eye out for the grazing goats, grab a seat by the lake and watch the world go by, before hitting Place de la Concorde and finally the Belle Epoque wonder that is Petit Palais. We adore its oasis-like garden (and so will your followers). How long will it take? 45 minutes (depending on how long you spend lounging in the gardens). Who's it for? Aspiring graffiti artists. Expect your eyes to be on stalks with over 25 stunning wall murals. This open-air art gallery is crying out to be 'grammed. Where do I start? Get off at Corvisart (line 6), take rue Barrault befoe doing a zig-zag route round the grid of cobbled streets, to end up back at Place d'Italie (line 5, 6 and 7). How long will it take? 30 minutes, but factor in a bit longer so you can grab dinner at couscous temple Chez Mamane. Who's it for? Ideal for trainspotters and ramblers, this 32km abandoned railway line crosses the 18th, 15th and 16th arrondissements, but it's most famous section enters into the famous coulée verte in the 12th. A mossy wonderland. Where do I start? Our favourite stretch goes from parc André Citroën to parc Georges Brassens. Look for out for the 200 different types of plants, plus plenty of butterflies. How long will it take? 35 minutes but much longer if you decide to walk the full length. Who's it for? Cobble obssessives in search of a break from the buzz of Bastille. Where do I start? Leave from Bastille metro and take the gated courtyard next to Paradis du Fruit, you'll hit the bucolic Cour Damoye and pop out on Boulevard Richard-Lenoir (perfectly timed for the expansive Thursday food market). How long will it take? 5 minutes – the perfect detour when you want to avoid the crowds on rue de la Roquette. Who's it for? Anyone who's been to the High Line in New York and is hankering after a bird's eye view of Paris. Where do I start? Start at Opéra Bastille and take the stairs up on rue de Lyon, where you'll hit the start of the Coulée Verte and finish up at Porte Dorée (near Bois de Vincennes). How long will it take? 90 minutes but leave extra time for photo opps (especially the coy giant statues near Gare de Lyon). Who's it for? Rue Crémeiux's cheery colour scheme is every pastel addict's dream. No filter necessary on Paris's answer to Portobello Road. Where do I start? Start on the rue de Bercy end and you'll exit on rue de Lyon – which is close to the Coulée Verte (two idyllic walks in one). How long will it take? 10 minutes maximum – perfect for a lunchbreak wander. Who's it for? Bargain hunters and magpies. Where do I start? Enter the market from Garibaldi métro rather than Porte de St-Ouen – a longer trek on line 13 but you avoid the crowds and new tat. Browse Marché aux Puces de Saint-Ouen until your eyes (and wallet) get tired, before taking the stairs up to Montmartre. How long will it take? Give yourself at least three hours for this one, it demands plenty of time for browsing. Factor in a full day if you can spare it. Who's it for? Fans of the film Amélie – and shopaholics. Where do I start? Get off at Notre-Dame-de-Lorette (line 9) and take rue des Martyrs uphill. This area has some of the quirkiest shopfronts in Paris, so you will be itching to snap every single one. Follow the route upwards until you hit the Sacré-Coeur, via several designer stock shops, vintage bazaars and offbeat choices like Tombées du Camion (7 Rue Joseph de Maistre). Perusing perfection. How long will it take? This magical area deserves a full day out but you could certainly hit all the best shops in half that time. Who's it for? Those in search of a completely different side of Paris – but leave the stilettos at home as these hills are on a steep incline. Where do I start? Get off at Ménilmontant (line 2) and take boulevard de Belleville, then a right onto rue de Belleville, where you'll reach Paris's Vietnamese district. Follow the steep incline and take a left at Pyrennées metro, where eventually you'll hit the stunning Parc de Buttes-Chaumont. Grab up a picnic from any of the independent shops on avenue Simon Bolivar and you have Insta perfection. 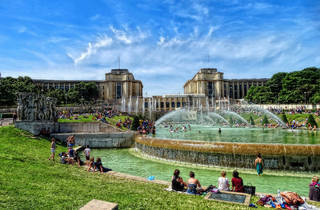 You could even hit up Parc de Belleville if time allows afterwards. How long will it take? Really, you could while away a whole weekend in this area if the weather is decent – but we'd recommend three hours for maximum enjoyment. Who's it for? Even the fussiest of foodies. Where do I start? Factor the Marché des Enfants Rouges into a walk around the North Marais, although it's easily accessible from Filles du Calvaire or Saint-Sébastien Froissart if you only want lunch. But 'only' is an understatement – you will be spoilt for choice with Lebanese, African, Japanese and Italian hot food stalls. Expect to be torn between snapping your food and wolfing it down. How long will it take? Ideal for a quick recce – or a lunch as part of a larger Marais meander.